When the Special Olympics athletes, coaches, families and friends came together to celebrate 25 years of organization and competition in Wetaskiwin, they celebrated an impressive record of success. This record is represented by the many trophies, medals, and ribbons won by individuals and teams competing at all levels: regional, provincial, national and international. It is represented by the athletes and coaches chosen to join the provincial team for national competition, including Sheana McDermott being asked in 2013 to be Head Coach for bowling at the National Games. 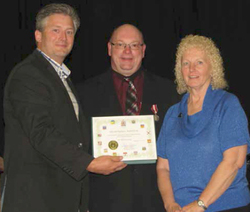 It is seen in the many times local coaches have been recognized provincially as Coach of the Year. Very significantly, it is represented by the Queen’s Diamond Jubilee Medal presented to Blain Fuller for his many years of exemplary work with the Special Olympics. One of the most endearing aspects of the Special Olympics is the supportive attitude of so many of the athletes; many are the incidents of runners stopping mid-race to help up a fellow runner who stumbled and fell. During his excellent power point presentation of the Wetaskiwin athletes history of participation, travel and success, Blain Fuller told the story of their fastest runner who always came in second. Race after race, Richard, barely breathing hard, would cross the finish line right behind the exhausted winner. It took a long time for the coaches to realize that Richard just loved to run; he didn’t know that he should try to win; he didn’t know where to go if he didn’t follow a leader. The Special Olympics are about quality of life, healthy activity, healthy self-esteem and self-worth, experience, inclusion in the community, and each individual reaching his or her true potential. While the international movement of the Special Olympics was started by Eunice Kennedy, there were many years of local and regional competition long before the formal organization. Alberta Special Olympics were officially organized in 1980. Volunteers are an essential part of Special Olympics. Blain Fuller and Sheana McDermott received recognition from Alberta Special Olympics for their outstanding contributions in many roles since the beginning. Both have been a Coach of the Year. Sheana organized the Anniversary celebration with Blain’s help with the program. Glenn Ruecker has supplied transportation from the beginning. Jan and John Schwonik were recognized for five years of coaching curling, while Jason and Tara Gillow, and Jan and Jerry Pydde were recognized for their 15 years of effort. Many others were also mentioned, including the important role Darren played in the original organization process, and Betty Korvaks’ assistance from the beginning. Far too many have been deeply involved for any one evening program to name them all, but the assistance of each one was necessary and greatly appreciated for making Special Olympics such a success. The delicious dinner for the Anniversary celebration was prepared by “Uncle Joe” who has been cooking for the Special Olympics events since he did a barbecue for them in 1995. The evening had its own special ambience, a leisurely pace characterized by people helping people, with many types of disability in evidence, but not limiting the enthusiasm. The athletes participating in the Special Olympics in Wetaskiwin have taken upon themselves the project of collecting bottles to raise funds to assist their fellow athletes to afford travel and meals when participating in distant events. Through the cooperation of No Frills, Shaun Pydde has raised $4500 since starting in 2010, and bottles held aside by the Millet dump have brought in $7100. These athletes are also involved in the community including working and volunteering in a huge way at the Nascar events. Through the years, Wetaskiwin has hosted many regional competitions and the Alberta Winter Special Olympics February 7-9 of 2003. A week before they were to start, there was no snow in Wetaskiwin. The scrapings from cleaning the ice in the arenas was put on the competition field, but it wasn’t enough. Then a storm blew in, and there was lots of snow just in time. There were 600 athletes and 300 volunteers involved in those games. There was a minute of silence remembering the 20 volunteers and 15 athletes of the Special Olympics who have passed away but are remembered with appreciation and gratitude for their part. Mayor Bill Elliot called the Special Olympics “a hidden gem in the community” when he expressed appreciation and thanks to all who volunteer and work behind the scenes to thus maximize abilities.